These three-position thumbs are ideal for use in demolition, recycling operations, landscaping and general construction applications. 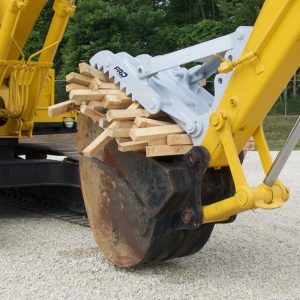 FRD USA offers a full line of thumbs designed to fit carriers ranging in size from 3,000-120,000 pounds. All tines are fabricated with AR400 steel, which is 38 percent stronger and 46 percent harder than commonly used T-1 steel. All pins are machined from hardened steel alloy for low maintenance. Expanded range of heavy-duty thumbs permits installation on mini-excavators, rubber-tired back-hoes and excavators. All steel tines are fabricated with AR400 (abrasion resistant) steel, serrated and gusseted. AR400 is 38% stronger, 46% harder and resists wear better than commonly used T-1 Steel. Thumbs feature three versatile, ridged positions to adapt to a variety of working conditions. Pins are machined out of hardened steel alloy. Overall thumb width never exceeds the carriers minimum bucket width eliminating potential interference during operation. Thumbs fold flush and maintain a low profile when pinned flat against mounting bracket. No additional parts are required to hold thumb in retracted position. All units shipped with easy-to-follow installation instructions. Width 8" 12" 18" 18"
Length 28" 40" 48" 52"
Pin Diameter 2.00" 2.00" 2.00" 2.00"
Tine Thickness 0.50" 0.75" 1.00" 1.00"
Tine Length 28" 35" (40") 48" 52"
Width 24" 30" 34" 36"
Length 58" 62" 63" 73"
Pin Diameter 2.00" 2.50" 3.00" 3.00"
Tine Thickness 1.00" 1.25" 1.50" 2.00"
Tine Length 58" 62" 63" 73"